It is a truth universally acknowledged that a single woman in possession of an overwhelming desire for a child will meet the man of her dreams as soon as she opts for an artificial insemination. Or at least that’s how it works in the movies these days. The Jennifers (Aniston and Lopez) have been much derided of late for taking parallel trips down this dubious narrative road in a pair of underperforming rom coms The Back-Up Plan and The Switch. Never mind that these two films aren’t remotely in the same league. Since they both feature aging actresses who are: 1) annoyingly omnipresent in the media and 2) ill-positioned for midlife career transitions, it’s just too convenient to batter them with the same club. That ill-calculated insemination scene opens the film From there, it’s a matter of mere minutes till Lopez is on the curb fighting over a cab with a Central Casting “studly yet sensitive guy” (Alex O’Laughlin). Yes they finally wind up sharing the cab. Yes, he pops up again at the farmer’s market she visits the following Saturday, feeds her some of his delicious, homemade cheese, asks her to dinner, and well….. you don’t really need me to tell you where that leads. You can feel Lopez and O’Laughlin working like gangbusters to infuse some red-hot chemistry into their scenes, and in all fairness, the thin and uninspired script (by Kate Angelo, a veteran of TV’s Will and Grace) gives them precious little to work with. When the most that’s at stake on a first date is whether Lopez reveals that she bought a new dress especially for the occasion, you know you’re in for a long slog of a movie. I’ll confess I’ve seen little of Lopez’ work outside the romantic comedy genre, and the best I’ve seen from her was in Steven Soderbergh’s Out of Sight, some twelve years ago. But she strikes me as particularly unsuited for rom com roles; in this film, as in her earlier attempts (The Wedding Planner, Maid in Manhattan), there’s an underlying desperation in her attempts to be adorable, a sense that’s she’s straining to hit the comic beats rather than feeling them naturally. (As opposed to, say, the effortlessly loopy and vulnerable Sandra Bullock, an actress who never met a punchline from which she couldn’t wring a heartfelt laugh.) The offscreen Lopez is a bit of a powerhouse – successful in the music, fashion, and fragrance industries and a triathlon competitor to boot – and I sometimes have the impression she’s busting her chops to add “endearingly goofy film comedienne” to her resume as well. That particular accomplishment may be forever out of her reach, but is that so bad? Maybe Lopez needs to give up on assuring us that she’s still Jenny from the block, and find some meatier, more complicated roles that exploit her innate determination and ambition. It depresses me that her next career move is straight into an American Idol judge’s chair . Like so many other 40ish-and-up actresses (Glenn Close, Kyra Sedgwick, Juliana Margulies, Holly Hunter), I have a hunch that Lopez could be doing bang-up work on scripted series TV. Someone write her a fabulous character, please. Meanwhile, on the Jennifer Aniston front…. The Switch is worlds apart from The Back-Up Plan. From its opening scenes, it feels less like a calculated mainstream entertainment than a scruffy indie flick, whose literary pedigree (it’s based on a New Yorker short story by Jeffrey Eugenides) is assured. And despite the fact that she’s out there giving the interviews and battling Bill O’Reilly on the ethics of single motherhood, it ain’t Jennifer Aniston’s movie. The Switch belongs, almost completely, to Jason Bateman. Bateman plays Wally, a hard-drinking, neurotic mess of a guy who’s concealed his true feelings for Kassie (Aniston) over the course of their 6-year platonic friendship. When Kassie hits 40 , still single and longing for a baby, she announces that she’s getting inseminated and plans to raise a child on her own. The opening scene of the film, in which she delivers the news to Wally over lunch, is promising, perfectly capturing the tetchy rhythms of a conversation between old friends who both love and infuriate one other, who know which of the other’s buttons to press and which things should be left unsaid. At Kassie’s insemination party (a scene not nearly as awful as it sounds), Wally drunkenly stumbles into the bathroom, accidentally spills the sperm donor’s sample into the sink and winds up replacing it with his own. Come morning, a seriously hung over Wally has no memory of what he’s done, and Kassie soon takes off to her hometown in Minnesota to have her baby and raise it among family. A forlorn Wally is left in Manhattan to forge a new life without her, awkwardly at best. There is an uncomfortably brilliant scene in which Wally and his date break the ice by jokingly imagining their doomed future together; it devolves into him picturing himself as a pathetic middle-aged divorcee on the prowl for younger women and his date as am embittered alcoholic. Both Bateman’s nervously droll delivery and his date’s slow-morphing reaction from good-natured laughter to cool politesse to outright mortification are letter-perfect. And that’s about where Eugenides’ story ended, but screenwriter Allan Loeb tacks on a second act that delivers a few pleasant surprises before fizzling and falling down the rabbit hole of formulaic predictability. Kassie gets a job at ABC and returns to New York, her precociously bright and deeply oversensitive six-year-old son in tow. It’s all too obvious that the boy is Wally’s son, even if the physical resemblance that strangers can’t help remarking on is, in fact, totally non-existent. (Child actor Thomas Robinson has enormous, owlish brown eyes in contrast with Bateman’s’ relatively beady, ice-blue peepers.) The ways in which their neuroses and fears line up, even their shared habit of moaning ecstatically over good food, unmistakably brands them as members of the same tribe. Kassie pushes them to develop a relationship, and though the bond is predictably uneasy at first, Bateman and Robinson have such a sweet, unforced chemistry that their growing closeness is a joy to watch. It’s only when Kassie’s sperm donor (Patrick Wilson) inexplicably re-enters the picture and becomes her lover, that The Switch detours into the safe, predictable formula that characterizes all the worst of contemporary romantic comedy, and it runs completely off the rails. I’ll spare you the details, but I can’t resist warning you that the happy ending it finally spins towards is in no way credible given all that’s preceded it. Bateman’s Wally is a meticulously modulated characterization, neither playing Wally’s tics and eccentricities for broad comic effect nor softening the more difficult aspects of the character into audience-friendly cuddliness. 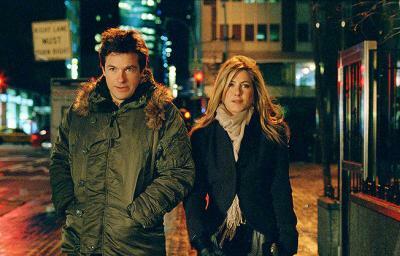 And although she has a few nice scenes early on, Aniston pretty much gives the picture away to him (New York Times critic Stephen Holden aptly compared her screen presence here to that of a vanilla milkshake). Whether that’s by the directors’ design or due to unintentional sloppiness is hard to say. I’ve always contended that Aniston can be a fine, affecting performer when she works with a good director (e.g. Nicole Holofcenter on Friends with Money, Nicholas Hytner on the underrated Object of My Affection). But Josh Gordon and Will Speck, who cut their directorial teeth on Geico’s “Caveman” commercials, might not possess the delicate touch needed to get the best out of their leading lady. Or at least, not consistently. During the insemination party sequence, there’s a very tender and beautifully played scene in which Wally finds Kassie alone at her bedroom window, away from the drunken revelry outside her door. “I thought having a party would make it fun, but now I’m really depressed,” she confides to him, and it’s an honest acknowledgment of the serious life step she’s about to take. Wally manages to comfort and reassure her without once falling back on his trademark irony and cynicism. If The Switch had managed more of those kinds of scenes in its final third, this review would be glowing rather than merely lukewarm.